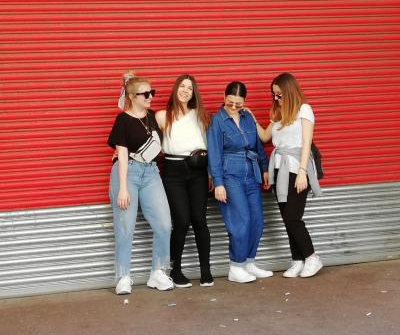 Students Lydia Asimakopoulou, Melina Bentivoglio, Georgia Sotiriadi, Areti Tsimpouxi worked with Greek clothing brand, Karavan to devise a launch plan for the UK market. To design a marketing strategy for Karavan, a Greek clothing brand, to launch in the UK including: conducting market research and producing strategy proposals to cover the short, medium and long term; designing a pop-up store as part of the UK launch. Karavan have an online presence which UK customers can access but they have to use the Greek website which isn't ideal. Notwithstanding this, the UK is the second biggest market for the brand after Greece and so the company were open to our proposal for this project. Although we are studying across three different disciplines we have some lectures together and had already made the connection that we are all from Greece, but we didn't really know each other well. Initially we applied to some of the LCF industry projects but when we were not successful in our applications we decided to look for our own industry partner and create our own project. We are all familiar with the Karavan brand and enthusiastic about it. We identified it does not have a presence in the UK and thought it would be great to work on a project which would help to establish it here. Working together has been surprising but amazing. The group has been well organised and focused, but at the same time we have had a lot of enjoyment out of the project and were able to have fun with it. "Our ideas and our interests were aligned by we found we have different but complementary skills which we were able to combine to bring the project to a successful conclusion." Some of the group are from a design background and others from business. We divided the tasks between us and assigned jobs according to our different skills. We all share the same level of commitment to the project. The good working relationship in the group created trust between us. This enabled us to share our concerns about our weaknesses and to take on board constructive criticism from each other. "We were prepared to push each other and to be pushed in return." What have been the key benefits of collaborating during your MA? This has been a very useful experience of what working life will be like when we complete our students, and has also been a useful networking experience. What have you learned from your collaborators and what have you taught them? We have all learned how to work as part of a team within our chosen professions. How to interact with people of different backgrounds and from different academic disciplines. We have seen how the different disciplines combine together to achieve a successful outcome. "We knew at the beginning that everyone's contribution is important but the project has enabled us to see in a very practical way the value and importance of all of the members in the team." We have gained an insight into the Greek clothing industry and Karavan in particular, and seen where its strengths and weaknesses lie. Time mamangement was a challenge because we are from three different courses. In addition, some of us were paricipating in more than one group project at the same time. Because of the great dynamic in the group, finding time for this project soon didn't seem like a challenge at all because we all enjoyed it so much and wanted to be working on it. There were some technical difficulties at the beginning, for example, we found workflow difficult to negotiate. The industry partner was based in Greece so a potential difficulty was the distance between us. This was resolved by one of the team having a face to face meeting early on in the process. We were then able to communicate successfully by Skype and email, including arranging the successful delivery of clothing samples for the photoshoot. Creating our own project offered the challenge of deciding for ourselves how extensive or ambitious it should be, how to set the criteria for the project, and what we could realistically achieve. We have to negotiate with our industry partner about the expected outcomes. What were the successes and/or highlights? We are all very happy with the outcome of the project and the marketing strategy proposals we delivered to the industry partner. Our report was well structured. It showed details of the research we had conducted and at the same time outlined in clear terms so that the client could understand our proposed strategies and how to implement them. "We enjoyed the autonomy we had from a self-directed project and feel that we learned more because we had to set our own criteria and deliverables." How will you use your experience? We will use the skills we have learned about working as a team in similar situations in the future. Working on the project is a great addition to our CVs. We would like to collaborate with each other in the future and perhaps start a business together. What advice would you give to new students about the Collaborative Unit? Be creative but at the same time be realistic about what is achievable. Be prepared to work hard. Find a project that interests you, that you can be passionate about because you will spend three months on it. We are passionate about promoting Greek fashion and we all love the Karavan brand. "Think of it not merely as an academic unit, but as a stepping stone on to your career and getting a job or starting a business." Use the opportunity to network. Pick a project with a brief that interests you, not necessarily the one with the best known name.